Welcome to the core of the real money online casino – CoolCat Casino! Plus, we’re constantly adding new games to the mix, so there’s something fresh and exciting for all players to discover at least once a month. But don’t worry – if you don’t want to bounce aroundfrom game to game, your trusty favorites will always be there to play and give you plenty of chances to win real money. Deposit today and we'll help you grow your bankroll with a match bonus plus free spins on some of our hottest games. Have a spooky good time battling zombies in Ancient China as you trigger the Free Games feature, discover extra Wilds, or hit a Wild reel for bigger wins. With plenty of bonus modes and re-triggerable free spins, this fantasy slot machine holds tons of options to win big. An Asian-themed slot with re-triggerable free spins and plenty of winning combinations where you can battle mythical animals on your way to the jackpot. CoolCat Casino has all the classic online casino games that players have come to know and adore on the gambling floor. From slot machines, baccarat, and blackjack to video poker, roulette, and craps, CoolCat Casino has the ultimate collection of online casino games for real money. We even have keno, bingo, and scratch card games! CoolCat Casino is powered by RealTime Gaming, the literally any location in the world, as long as there’s a Wi-Fi connection or data signal available provides the incredible graphics and smooth gameplay that our players have come to expect and love while playing our casino games. It doesn’t matter if you’re playing a table game like blackjack or a slots games like Cash Bandits – we guarantee you that you’re going to experience the same immersive playing experience that you’d have on the physical gambling floor. It’s one amazing reason why CoolCat Casino is one of the best online casinos for real money gameplay. All you have to do is sign up with a CoolCat account to begin the process, which takes less than two minutes. Then you can either begin playing for real money immediately on your Mac, or you can download and install the casino software on your PC for free and start winning money within ten minutes. Once you sign up, you have access to real money casino games 24/7, 365 days a years. Sign up and start playing the most entertaining online casino games for real money today! 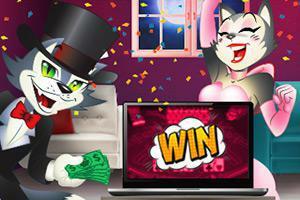 Play casino games and win real money at CoolCat Casino today! Just in case you’re still hesitating when it comes to online gambling for real money here at CoolCat Casino, here are the answers to some of the things you might be wondering about. What’s the deal with online casinos? Online casinos have grown into a booming industry. Regular brick and mortar casinos have been popular for a while, but the developments in technology over time have allowed players to have more access to what they want. The same things that casino goers love about their experiences don’t have to be limited to the time they spend at land-based casinos. As a $35 billion a year industry, online gambling continues to flourish, with an estimated increase of $50 billion in 2018. With online games’ increasing popularity, the once-restrictive laws surrounding internet gaming and real money gambling online have been developing across different countries and will continue to do so. Regulatory laws will only continue to improve to both allow people to play and ensure that games are fair. When it comes to our role in the growing market, we strive to ensure that CoolCat is the most profitable online casino for real money for all players of different backgrounds. What’s so special about CoolCat Online Casino? As we’ve already said, we have the most extensive variety of over 220 online casino games for real money – you just won’t find anything better out there in the world of casino games. It’s also important to us that you get started with a low-stakes environment. With us, you can always practice for free to get comfortable, with no limits or conditions. Once you make the jump to playing for real money, you have a chance to win big thanks to each game’s special features. That’s what makes us the best online casino to win money. One word: bonuses – this is equally as important to our players as the variety of options. As a reliable, competitive online casino, CoolCat offers all of its newcomers an advantageous real money welcome bonus for creating an account and making a deposit to guarantee a solid start. If you’re not a new player, we’ve still got you covered – we have many other offers that change all the time, including match deposit bonuses, free no deposit bonus, free spins, and free chips. You can also receive weekly promotions tailored based on your favorite games. Looking for more? Look into our selective VIP membership – it makes it even easier for our valued customers to earn additional points and special rewards packages. Let us help you get to winning real money today! Yes. While sketchy online casinos do exist, the reliable ones are certified and held to strict standards in order to maintain a solid reputation and build trust between players and casino operators. If you familiarize yourself with house edge and payout percentages, you’re sure to reap the benefits. Can I play on my smartphone? Yes, you can – in fact, you’re not limited to just a smartphone. CoolCat Online Casino is compatible with any mobile device that connects to the Internet – that means anything from iPhones, Windows phones, or Android phones to tablets of all kinds. Not only that, but completing a transaction is just as easy on your mobile device as it would be on a desktop or laptop computer. How do I decide which real money casino game I should play? There are up and downsides to virtual gaming. Your average land-based casino has a lot to offer, but it’s limited by space. They can have a hundred gaming machines, but they’re spaced out by necessity because they’re exactly that – large, rectangular machines. That means you can take your time in one section of the casino or another, and you don’t have to venture out. With an online casino, there’s a variety of real money casino games for players to select from, but it’s all just a few simple clicks or taps away from exploring all categories of casino games. That in itself can make for an overwhelming moment, just seeing all the options laid out in one place. Okay, I want to take a shot at online gambling for real money. How do I make a deposit? The transition from practice to real money is just as simple as signing up for an account in the first place. To make a deposit, log in, navigate to the cashier page, select the payment method of your choice, and decide how much to start with. We accept payment by credit card, debit card, Neteller, and Bitcoin. What about when I want to cash out? The process for withdrawals is just as simple. You’ll find the “Withdraw Money” option on the cashier page as well. To complete a withdrawal, you can opt for a cash deposit, Neteller, or wire transfer, just to name a few of our available methods. After that, it’s up to you to decide how you’ll use your winnings. If you’re looking for a live online casino for real money, give CoolCat a shot – you won’t regret it!